For those who like to stay fit and healthy, London is the perfect place. There are many health, fitness and wellbeing classes and workshops you can join in London, whether it’s yoga, pilates, mindfullness or a singing group. 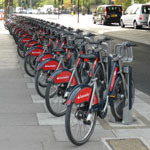 Gyms are located across London. They vary in price and facilities. Take part in a parkrun – 5km runs held on Saturday mornings in areas of open space around the UK. They are open to all, free, and are safe and easy to take part in. Join a group through www.meetup.com. This website promotes a diverse selection of groups to join. London is becoming a more cyclist friendly city. Always be careful when cycling on London’s busy roads. Cycle lanes are provided in some sections. London has an abundance of places to walk ranging from short walks through parkland and commons to the Capital Ring Walk covering 78 miles. Walk along a canal or river or take a route incorporating London’s famous landmarks. Join a walking club, for example, Ramblers or find a group on www.meetup.com. Or why not help raise funds for charity at Christmas time by joining one of the Christmas carol concerts.